If there is one thing I can guarantee a resounding YES to, it’s asking Athena if she wants to play with my hair. 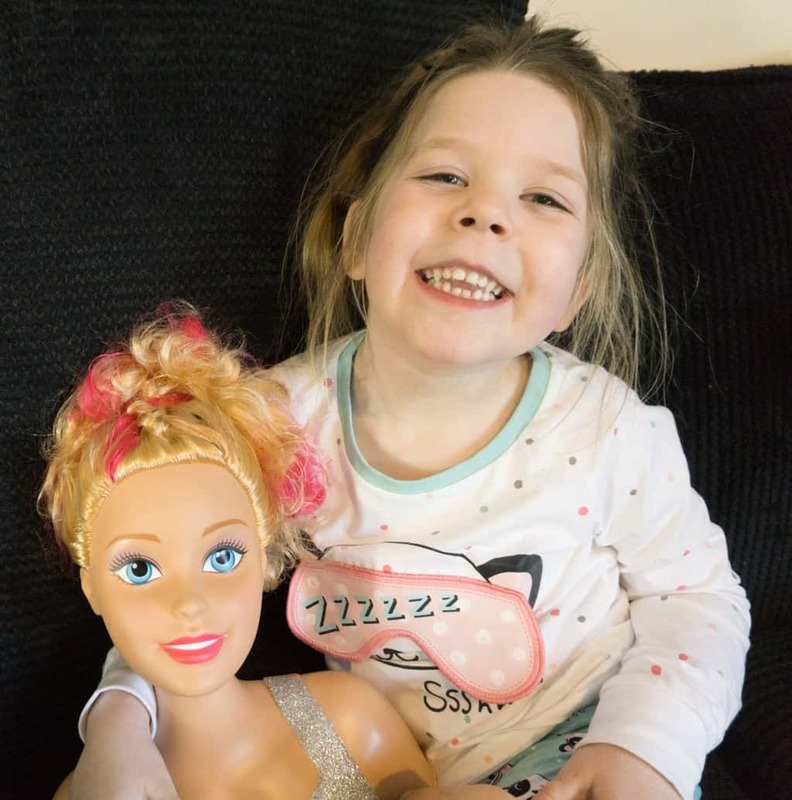 Unfortunately for her I find people playing with my hair supremely irritating, but now she can brush, plait and pull to her hearts content with her new Barbie Styling Head. 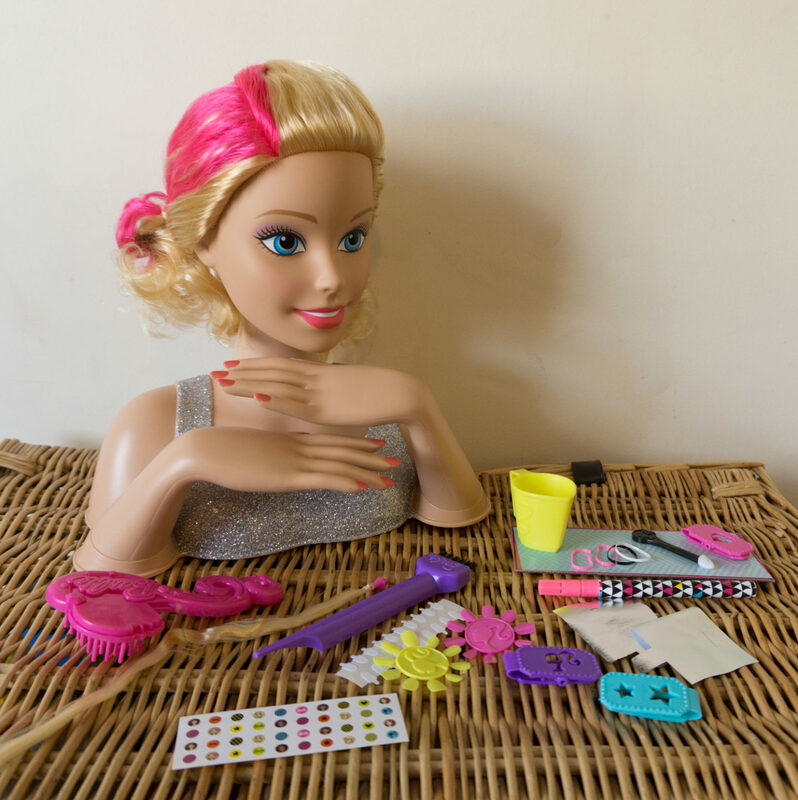 The little girl in me is pretty jealous, as I never had this sort of toy when I was little, and desperately wanted one, it was always the first toy I made a beeline for at friends houses when I went on playdates. So when Athena opened up the box and squeaked with delight I knew how excited she was, and the inner kid in me was a little jealous! 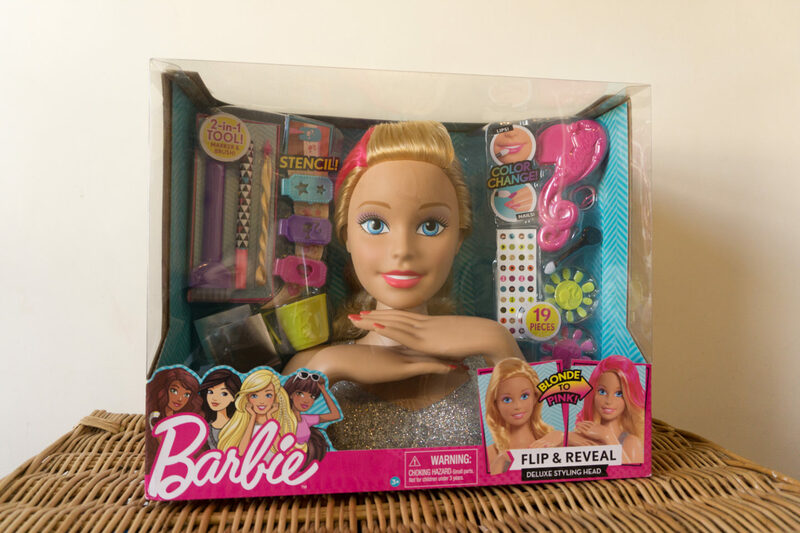 Barbie Styling Head comes with practically a whole salon-worth of accessories, there are brushes, clips and bands, colouring bits and extensions – loads of stuff! You even get some nail stickers and stick on coloured nails – for the whole beauty salon experience! 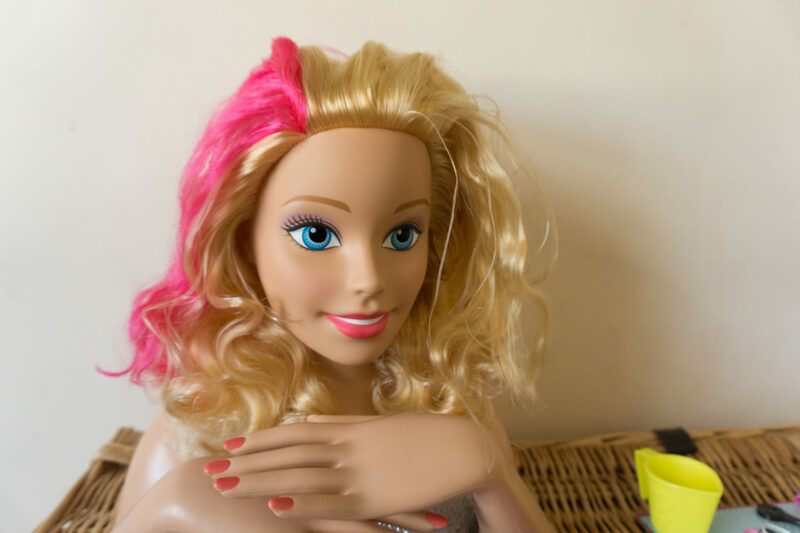 The really fun part is that Barbie has a chunky section of bright fuscia pink hair, which can be hidden or revealed depending on the hair style you choose. She could have a sleek up-do with a flash of colour, or a demure down-do and you’d be none the wiser. Athena has been loving trying out different styles, and can spend hours brushing out her hair, drawing patterns or colouring bits in, washing it off and starting all over again. The colouring felt tip that comes with the Barbie Styling Head can be used to colour individual sections or to colour in the shapes on the hair clips, though this is actually pretty tricky as the hair is so shiny and the clips move about a bit as you try and and simultaneously hold the clips in and colour the hair – it doesn’t stop Athena having a good go though! Also you must remember to wash the coloured pen off the /hair or skin at the end of playing otherwise it will stain. You can also insert it into one of the colouring brushes for a more random highlighting effect! The Barbie Styling Head also has colour changing nails and lips, which are activated by the temperature of the water that you apply, Athena is desperate to get hold of my makeup bag and give her styling head a proper make over- I should dig out some older bits and bobs I don’t use that much and let her indulge really! The hands move at the wrists too, which makes for easy manicures with the nails and stickers included. You can also use the stickers and nails on your own little fashionista, which Athena got really excited about! It’s safe to say this is Athena’s current favourite thing to play with, she even takes her to bed and pops her on the shelf next to her so she can play with her if she wakes up before it’s time to get up in the mornings! 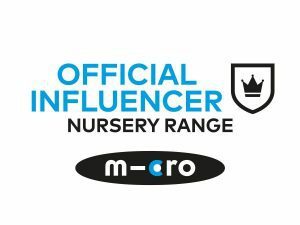 Please do join the #StylingHeadMonth Twitter Frenzy on UKmums.tv 13th April 1-2pm to find out more about the range. 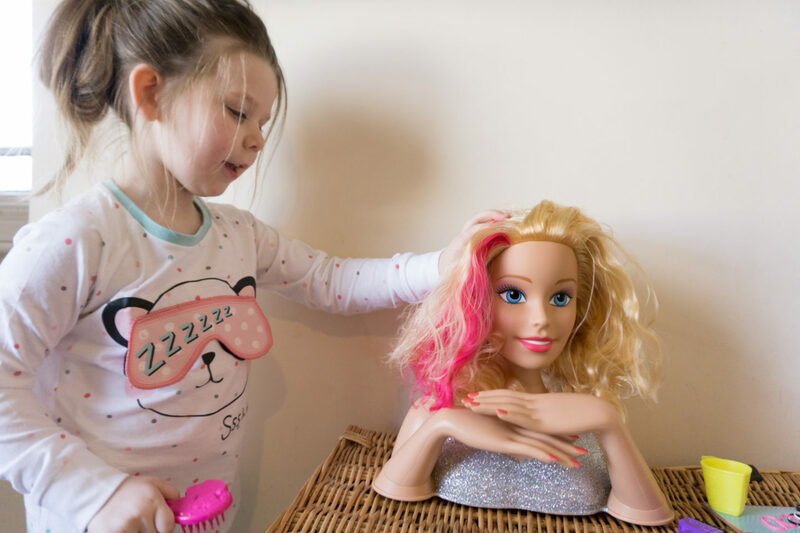 You can buy the Barbie Styling Head from lots of different retailers, including Argos and Amazon. We were sent this item for the purpose of this review. Previous Post Arlo is THREE!